Genius delivers the Traveler 9010LS, a new wireless laser mouse that promises to work on virtually every surface, including glass and marble. It has four-buttons and features an ambidextrous design to suit both left and right handed people. Users can adjust the sensitivy between 800 and 1600dpi. 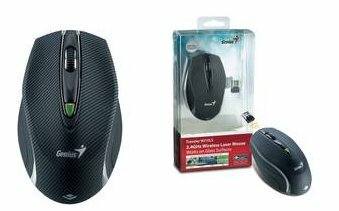 The mouse comes with a compact 2.4GHz USB receiver and supports both AA and AAA batteries. The MSRP is $39.99. Genius today releases a wireless laser mouse with a highly sensitive DarkEye Laser Engine - Traveler 9010LS. Suitable for both left and right handed people, this Genius four-button mouse can be easily carried around everywhere with your notebook or ultrabook and works on virtually any surface including glass and marble. For easy portability just stick the included plastic Stick-N-Go mount onto your notebook or ultrabook, and anytime you need to move you can simply slide this portable Genius mouse onto the mount for secure and trouble-free storage. When you need to use the Traveler 9010LS again, just slide it off the mount on your notebook. The 2.4GHz USB pico receiver allows users to work wirelessly from a distance of up to 15 meters. When the Traveler 9010LS is mounted onto the your notebook, the tiny pico receiver can be inconspicuously left in the USB slot adding more convenient portability. The Genius Traveler 9010LS has a four-button design. An adjustable dpi button allows users to switch the dpi to three different levels: 800/1200/1600. On the underside of the mouse an easily opened door conceals where either a AA or AAA battery can be placed. Also, the on/off switch on the underside of the mouse helps to extend battery life. The Genius Traveler 9010LS wireless laser mouse is available in the US and Canada now for the suggested retail price of $39.99.